(Bloomberg) -- Just how long can the eerie calm in stocks defy the panic buying in bonds? As a key pocket of the U.S. yield curve inverts and benchmark bunds sit in negative territory, a measure of interest-rate volatility staged its biggest two-day surge since 2016 this week -- while the Cboe Volatility Index for the S&P 500 remains effectively unchanged for the month. Wall Street strategists including Bank of America Corp. warn growth fears coursing through government debt around the globe could awaken U.S. equities from their slumber. The problem: There’s no obvious roadmap for how and when synchronized gyrations will play out as markets send conflicting signals on the business cycle. Technical indicators, corporate-earnings growth and valuations are keeping stocks on an even keel, while the so-called smart money in bonds fret the longevity of the economic expansion. If gyrations in the interest-rate market endure, they are likely to hit equity volatility at the sector-level first as “banks get bought and utilities sold,” according to Purves. But he foresees volatility will remain contained at the index level thanks to lower real rates and an accommodative Fed. In other words, the panic that’s spurred the Treasuries rally has a clear upside for stocks too. While hedging activity contributed to the massive plunge in yields, it’s difficult to ignore the growth angst out there. An ever-flatter Treasury curve with pockets of inversion bode ill for equity swings over the longer term, according to Bank of America Corp. strategists led by Savita Subramanian. “The yield curve has accurately predicted the contours of the VIX over the last three cycles, and its last few years of flattening portends that the VIX could double,” they wrote. 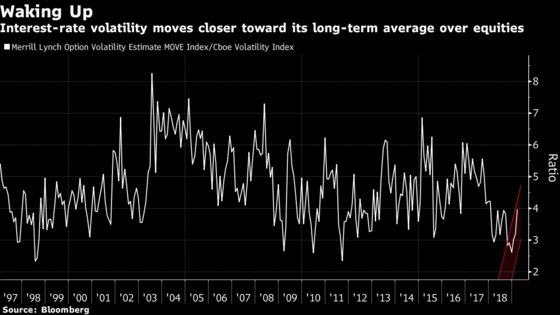 Still, aggressive equity volatility sellers are potentially playing a part to keep shares from swinging too much -- even as demand for protective options increases. 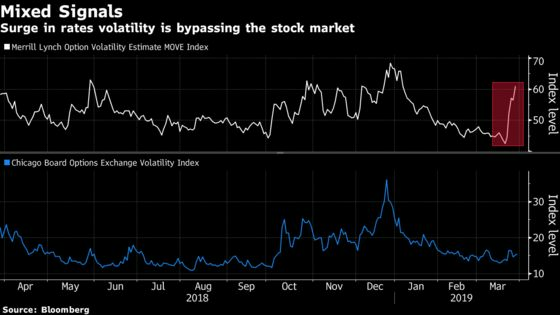 Matt Rowe, chief investment officer of Headwaters Solutions LP, said stock volatility is “artificially” low in a Bloomberg TV interview, thanks in part to options selling. What happens now is anyone’s guess.